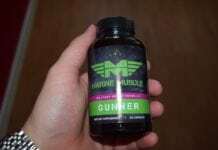 Is Nitric Max Muscle recommended? Nitric Max Muscle is a supplement that promises to produce real results by increasing blood flow to your body, resulting in more nutrients being delivered to your muscles. This process is claimed to produce stronger pumps and muscle fullness, yet despite its claims there is a nagging doubt in my mind that this supplement is not all that it claims to be. Lets look at Nitric Max Muscle in more detail to see whether you should give this supplement a go or not. Whether or not Nitric Max Muscle can do what it claims depends on what ingredients have been used in its formula. Nitric Max Muscle is made using Nitric Oxide or N.O. unfortunately there is no mention whatsoever of its dosages or if any other ingredients have been used. Nitric Oxide has benefits but without knowing how much is present or whether there are any added filler ingredients it is impossible to tell whether this supplement can do what it claims to do. There is no mention of the price of Nitric Max Muscle at all on the homepage, not even in the terms and conditions. The only way to find out this information is my submitting your contact details using their form, no doubt so that they can use this information to sell to you at a later date should you fail to conclude your purchase. Having submitted my information I discovered that Nitric Max Muscle is available in 3 different packages, starting at a starter package of 1 bottle costing £30.95. The largest package contains 6 bottles that works out at £18.95 per bottle, which is extremely cheap. Although Nitric Max Muscle is quite cost effective there are doubts in my mind that it is as effective as claimed to be. The lack of any ingredient information is certainly a big turn off. In my opinion you should look for an alternative. Although more expensive than Nitric Max Muscle, our recommendation is HGH-X2 (available from Crazy Bulk). This supplement contains ingredients proven to naturally boost HGH (Human Growth Hormone) levels, which will help ensure you see the maximum strength and muscle gains. Been caught out by this scam. People please read the small print before you sign up for any trial offer.